The stringent Reserve Bank of India circular that was issued on February 12 last year and which imposed tough loan conditions on lenders has hit hard infrastructure and power companies. The circular prohibited loan restructuring and asked banks to declare a company a non-performing asset (NPA) even if there was a day’s delay in loan repayment. Though bankers said the circular helped them to rein in erring promoters, chief executive officers are waiting for the Supreme Court, which is slated to hear petitions filed against the circular, to give them a reprieve. Several companies including Anil Ambani’s Reliance Communications filed for bankruptcy protection, citing the February 12 circular, which mandated that 100 per cent of lenders must agree to loan restructuring in a company. The circular said banks must make 100 per cent provision if they agree to any loan recast. “In most cases, there is no consensus among lenders on loan restructuring. This has led to many companies becoming NPAs. Companies in the infrastructure sector are specially hit because dues from the government are late in coming. The RBI circular tends to punish the companies which are awaiting dues from the government,” said the chief financial officer (CFO) of a large company. On February 1 this year, RCom said lack of 100 per cent approvals and consensus, as mandated by the RBI’s circular on all important issues, among over 40 lenders, Indian and foreign, led to the company filing for bankruptcy for its loans of Rs 45,000 crore. The company did not pay any dues to banks since June 2017 after it entered a standstill agreement with them. The power producer association moved the Supreme Court against the circular. Most power projects were hit due to reasons such as non-availability of coal and a proper power purchase agreement. In October last year, the Supreme Court cleared a plan by three Gujarat based power producers — Adani Power, Tata Power and Essar Power to re-negotiate their power purchase agreements (PPAs) after lenders including the State Bank of India submitted that these projects have become unviable due to a change in the Indonesia coal export regulations. During the hearing, Indian lenders, who have filed debt recovery suits under the Insolvency and Bankruptcy Code against 977 companies in the past two years, have said the three Gujarat-based loss-making power projects — Coastal Gujarat Power in Mundra, Adani Power Mundra and Essar Power — should be revived with some efforts by all stakeholders and not become insolvent. “The RBI must dilute the circular. Already thousands of jobs are gone as companies have shut down due to lack of funds,” said the CFO of another power company. Bankers, on the other hand, said the February 12 circular has brought in a lot of discipline among borrowers and lenders. According to Rajnish Kumar, chairman of State Bank of India, the country’s largest lender, the insolvency and bankruptcy law, along with the circular, has made sure erring promoters now come to the table to negotiate. The government wanted the RBI to provide some relaxation in the circular, at least for the power companies. Some banks also requested the RBI to relax the norms fearing further pile up in bad debt. Gross NPAs of public sector banks stood at Rs 8.45 trillion at the end of March 2018. By September, they fell to Rs 8.26 trillion and 10.8 per cent of advances for the system as a whole. “It is a very good circular, and no major dilution is needed. It set a clear cut boundary line, and gave full freedom to banks,” said V G Kannan, CEO of the Indian Banks’ Association (IBA). What did the circular say? On February 12, 2018, the RBI released a notification which would change the banking landscape in India and alter the way borrowers and lenders behaved. 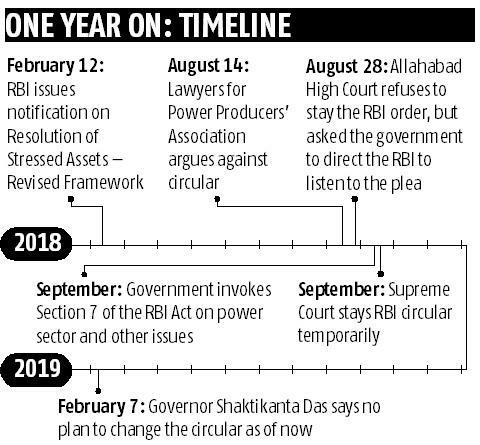 “Resolution of Stressed Assets – Revised Framework”, now better known as the February 12 circular of the central bank, said even a day’s delay in servicing loans would be now taken as a ‘default’. And once in default, for loans above Rs 2,000 crore, the banks will have to arrive at a resolution within 180 days. If a resolution plan is not arrived at within the stipulated time, lenders will have to file an application under the Insolvency and Bankruptcy Code within 15 days. In short, the business would be up for sale if the company doesn’t pay on time.